Chances are you’ve heard that jobs in computer science, computer programming, and other related fields are highly lucrative right now. As technology develops, there is an increasing need for people who can continue to work with the growing needs of technology companies and of the general public, who are used to things becoming more high tech as the years go on. What you may not know is what skills you need in order to get into a field like computer programming, or even why computer programming is important. Even if you don’t intend to go into a technology-related field, the ever-growing demand for computer literacy may be reason enough to consider taking a class on computer programming for beginners. The whole point of computer programming is to tell computers and other machines what they need to do. Apps, software, websites, etc. don’t just exist because you have a physical computer, they need to be coded. Do you have a favorite game that you play on your smartphone? That app was made using one programming language or another. Do you like to shop on Amazon? That site had to be coded. Do you listen to music on Spotify or watch movies on Netflix? Both had to be built from the ground up using computer programming. Coding languages “teach” a computer (or smartphone, tablet, etc.) what it has to do. Your computer doesn’t just “know” what Hulu looks like and what it does, lines of code on the back end of the website are telling it how it needs to function. Facebook, Dropbox, Twitter – none of these things would be usable without groups of people working to build them and develop them using computer programming and coding. But why should you learn programming? Many people learn it so that they can eventually go into the field of computer programming, as it can make for a very lucrative career and people enjoy being able to use their creative side to come up with new apps, software, etc. Anyone can learn some basic coding, though, even if they don’t intend to make a career of it. Do you run a blog, create art, sell handmade jewelry? You may want to create a website for yourself in order to display and/or sell your work. Somebody else could do this for you, of course, but being able to code a website yourself can help flex your creativity and also save money if you’re just starting out. Do you use a program like Excel a lot for work? You could create a program to help you use formulas and perform tasks you do over and over again more efficiently. Maybe you just have an idea for a game you’d like to play on your phone that doesn’t exist yet. So build it! There are endless possibilities for what you could do with a little bit of programming knowledge. Programming is an expansive field and not even the best programmer may know everything about every single coding language. Where you start your quest to becoming a programmer will ultimately depend on what purpose you want your programming to serve and what programming languages you’ll need to learn to fulfill that purpose. There are a few that are a good place for beginners to start, however. A dynamic coding language is a good place for any beginner to start. These languages are easier to learn, tend to be more flexible when it comes to coding rules, and these languages often require fewer lines of code in order to quickly build an app, for example. One example of a dynamic language is Ruby. This is a great way to learn computer programming for beginners as it is easy and fun to use. Many websites, like Airbnb and Hulu, were designed using Ruby. Another good place to start is with Python. This is actually one of the most popular of coding languages for beginners and those taking introductory courses. You can use Python to code desktop apps and mobile apps, as well as for data analysis. Sites like Pinterest and Google were made using Python, so you know it’s a very useful skill to have! Another type of coding language is statically typed languages. These can be slightly more difficult for beginners to learn, as it takes more lines of code to build apps, websites, etc. However, these languages also tend to be more stable and many mobile apps are developed using statically typed languages. One example of a good place to start if you want to learn a statically typed language is Java. You can use this language to make games and Android apps. It’s a very common language so there are a lot of books, classes, online tutorials, etc. to help you learn it. Another good place to start is C. This is an excellent place to start as many other languages, including C++ and Objective-C, were influenced by C. It can be tough to learn at first since the coding is more complex, but if you want to program system software or learn other coding languages that work similarly to C, it’s a great language to know. Whatever language you choose to start with, you can be assured that there are going to be resources out there for you. Coding is becoming more and more popular and many languages have been around a long time so you don’t have to worry about having a lack of available study materials. There are many ways to begin learning to program. Walk into any bookstore and you’ll find whole sections filled with shelves and shelves of books on different programming languages. Look at any university course catalog – even if they don’t offer a degree program in Computer Programming, they are sure to have a few introductory classes on some of the most commonly used languages. There are multiple websites, for children and for adults, where you can start going through exercises to learn to program. 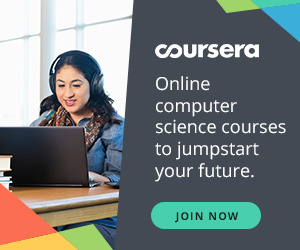 One website where you can get started is Coursera. If you are a true beginner with no previous knowledge of any programming language, you might want to start with a course like “Learn to Program: The Fundamentals”. The language you’ll learn in this course is Python, which as previously discussed is one of the best languages for beginners to start with. This course will go over the basics of what Python is and how to use it. You’ll learn how to use variables and functions with Python and you’ll learn terminology such as “Booleans” and “Tuples”. Each week you’ll gain new skills in order to create your own programs. For those who want to learn more than just the basics, Coursera offers specializations with groups of courses to help you further build your programming skill set. There is a “Python for Everybody” specialization, for example. This starts with an introductory course, “Programming for Everybody (Getting Started with Python)” and ends with “Capstone: Retrieving, Processing, and Vizualizing Data with Python”. In the last course, you’ll use all the knowledge you’ve gained in the previous four classes in order to build your own applications using Python. This specialization, and the others offered, is designed to build up your skills and ultimately have them culminate in a final experience where you get to actually utilize those skills. Taking a specialization is a great idea for anyone who is wanting to move beyond computer programming for beginners and really get into the field. Computer programming is an expansive field. Nearly every piece of technology you use, every website you visit, every app you have on your phone, and your phone itself, was at some point touched by a programmer. As we become more and more technologically advanced, the need for programming is only going to grow. So why not learn at least some basic programming? There is such a rich variety of programming languages and uses for those languages that anyone is sure to find some aspect of programming that they can use and enjoy. Taking a course in computer programming for beginners doesn’t necessarily mean that you’re going to become a star programmer, of course. Taking a course on is definitely worth it, though. Programming is all about making our lives easier, being able to use technology to its fullest, and flex a bit of our creative side along the way, so why not learn a new skill and become part of the community of programmers today?